Talk about drama! Tonight's show was full of it. 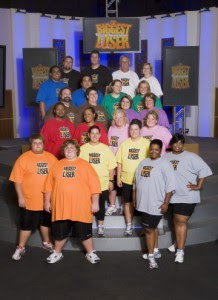 If you've watched any of The Biggest Loser-Season 7, you know that Joelle was the show's 'problem child'. Well, no more. Joelle Gwynn was sent home tonight. Unfortunately, her teammate (and ex-best friend), Carla Triplett, shared her teammate's misfortune and she sure didn't deserve it. Carla lost an impressive 9 pounds, while Joelle lost no weight at all. ZERO! It's sad because Carla had to pay the price for Joelle's lack of effort. The silver team along with the brown team fell below the yellow line tonight. It was up to the rest of the players to vote which team to send home. Everyone had the impression that Joelle didn't really want to be on the ranch. She always claimed she was trying hard but nobody bought it. Out of the five weeks she was on the ranch, Joelle only showed true effort one week - and it was that week she lost a significant amount of weight. After last week, I thought Joelle had turned the tide, but this week she was back to the same old Joelle. This season's Biggest Loser has been interesting. Tonight was the fifth episode. Following is the order of the eliminations: first the white team was sent home, then the red team, followed by the orange team, and now the silver team. Carla was The Biggest Loser's heaviest female to ever compete. She started out at 379 pounds. The first week on the show, she and eight other contestants were sent home. Over the last four weeks at home, Carla lost 20 pounds. It's very impressive to me that Carla lost 40 pounds in five weeks, with four of those weeks being at home. Since leaving the ranch, Carla has lost 47 more pounds for a total of 87 pounds! On the other hand, Joelle has only lost 57 pounds. That tells you all you need to know. Check out Joelle and Carla's "Where Are They Now?" video here. We don't have television, but this show sounds interesting. The personalities of these two is quite something. Too bad Carla didn't have a really good friend that was willing to participate. I'm glad Carla is still losing weight though. What amazes me, is that somebody would not be willing to give 100% commitment and effort, when given such an amazing opportunity. The one really wanted to be there so bad ... and he needed to be, quite desperately! I wanted to smack Joelle by the end of the show. The way she treated Carla in the coffee shop was just terrible. I hope that by the finale Carla reaches her goal. I hope that Joelle *does* lose the weight for her own health, though. She really needs to. That was some show. You could see how everyone hated voting Carla off, but they had no choice. I like to come in on this show after they've been at it a while and are more transformed. Thanks for the update. Dawn - I know! How in the world could Joelle be so selfish? Beats me! I really felt bad for Daniel because it was David's lack of effort and bad attitude that sent them home as well. And Daniel was such a sweetie too. I sure hope he continues his weight loss at home. Sadie - I thought it was awful too. I'm proud of Carla for being so composed. I know she must've wanted to smack Joelle. I hope both Carla and Joelle continue their weight loss at home too. Da Old Man - Yup, it was terrible to watch. I wanted to strangle Joelle! How in the world she could blow such an awesome opportunity is beyond me. Davida - I hate missing even one show. I love watching the contestants do the weekly challenges and of course I love the drama! :) The shamefully obvious product placements get on my nerves though. Oh, well... somebody's got to pay the bills, right? I love the Biggest Loser, I was really happy to see Joelle go home. I do feel bad for Carla but at least she went home and seemed to be able to keep up on the weight loss. HappyMommy3 - I was glad to see Joelle get the boot too. It's just sad that it was all so unnecessary. Don't you just love Carla? She's a fighter. I can't wait to see how she looks at the finale. I think there's something wrong with people saying that losing 57 pounds in less than a year shows that Joelle was not committed. The show used her as a scapegoat so people would hate her. There have been plenty of participants who didn't lose that much - why so much hate for Joelle? I did not like how everyone ganged up on Joelle including her so-called best friend Carla. I don't think anyone would call someone their best friend after being treated that way.